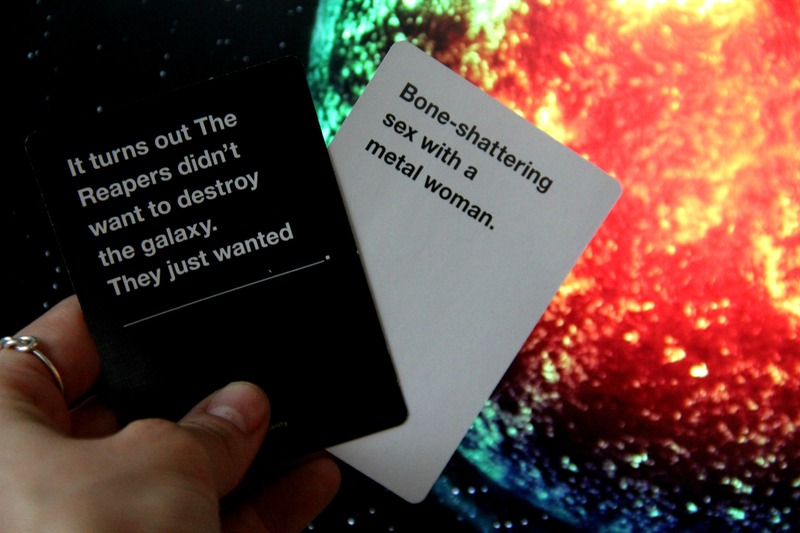 Cards Against Humanity is one of the better party games currently on the market, so long as you don’t mind a bit of vulgar humor. Having played the adult-themed Apples to Apples clone on multiple occasions, I'll be the first to admit that the game can grow a bit stale over time. Such is especially true if you play with the same group of friends although there is a simple remedy that keeps the card game fresh: expansions. There’s no shortage of expansions already available at a variety of price points but the latest will only set you back a buck. The Mass Effect Pack from BioWare and Cards Against Humanity features 14 new Mass Effect-themed cards to add to your deck. That’s not very many cards, sure, but again, it’s a dollar… shipped. The FAQ notes that those who haven’t played the Mass Effect series probably shouldn’t bother with the expansion because after all, what fun would it be if you didn’t get any of the references? Trin Garritano, events manager with Cards Against Humanity, told Polygon that the idea for a themed pack came about during San Diego Comic-Con a couple of years back. From that point, they came up with more than 700 potential cards yet only the top 14 made the cut. Stock is apparently limited so if you’re interested, it’d be best to go ahead and get your order in ASAP.